The Hawaiian shirt makes a comeback The loud colorful Hawaiian shirts sported by Magnum PI are making an unlikely comeback on catwalks and in Europe's most fashionable stores, Die Welt reports. The unlikely revival started last summer. Bright flower prints made a splashy comeback on the catwalk when both Stella McCartney and Givenchy showed exotic patterns featuring birds of paradise and palm leaves. A few months before, Miuccia Prada had already shown wide, short-sleeved shirts with Caribbean motifs in her women's collection. This does not explain why the most dreaded piece of clothing in a man's wardrobe is fashionable again. Since its emergence in the 1930s, the Hawaiian shirt has gone through a number of phases. Harry Truman was photographed for the cover of Life wearing one. In 1952, Frank Sinatra and Montgomery Clift wore Hawaiian shirts in From Here to Eternity, while, in 1961, Elvis Presley donned an orchid-printed model and sang "Can't help falling in love" in Blue Hawaii. That was the harmless phase. Dialogue from an episode of The Simpsons tells us the kind of image the shirts have today. Homer: "Marge, our son was wearing a Hawaiian shirt today! There's only two kinds of guys who wear Hawaiian shirts: gay guys or big fat party animals! And Bart doesn't look like a big fat party animal to me!" Marge: "So if you wore a Hawaiian shirt, it wouldn't be gay?" Homer: "Right! Thank you." The big fat party animals -- stock figures in the party scenes of American comedies, standing there holding a drink topped off with cocktail umbrellas -- are the ones who gave Hawaiian shirts a bad name. In Germany in the 1980s, entertainer Jürgen von der Lippe, the last German party animal, looked so tacky in his Hawaiian shirt that nobody else wanted to be caught dead in one. The Hawaiian shirt's lowest point came in 2002 when a mug shot of actor Nick Nolte, high on liquid ecstasy, showed him wearing one after leading police on a chase through the streets of L.A.
Of course the shirt also was also worn by desperado types: Al Pacino wore one in Scarface, and the gang known as the Montague Boys wore them in Baz Luhrmann's Romeo and Juliet. In the United States, the gay connotation can be traced back to an icon of the gay community during the last great Hawaiian shirt era in the 1980s: Tom Selleck, who in the TV series Magnum, wore Hawaiian shirts almost exclusively (which actually made sense, since the series is set in Hawaii and the laid-back style suited his character, private detective Thomas Magnum, to a tee). No other item of clothing screams “leisure wear!” louder than the Hawaiian shirt. For that reason (and many would say unfortunately) it is unsuited to office wear. Today, a shirt that draws that sharp a line between work and after work is something of an anachronism. Today, when people are holiday, they don't dress in a way that would make them stand out as tourists – particularly the type known as the “American tourist,” with his camera hanging down over his fat stomach (an image eternalized hyper-realistically in 1988 by Pop artist Duane Hanson), now extinct. So what on earth, in the year 2012, would bring Hawaiian shirts back again? Are they so uncool they're cool? Shirts by the same manufacturer who made the shirts Tom Selleck wore in Magnum are on sale this season at Schwittenberg, a Munich concept store. It took a little getting used to at first, but now as summer is getting into full swing the store can hardly keep enough of the shirts in stock to supply demand. Let's face it, there's hardly a better shirt to wear for BBQs, and even the issue of their suitability for the office may soon be solved. 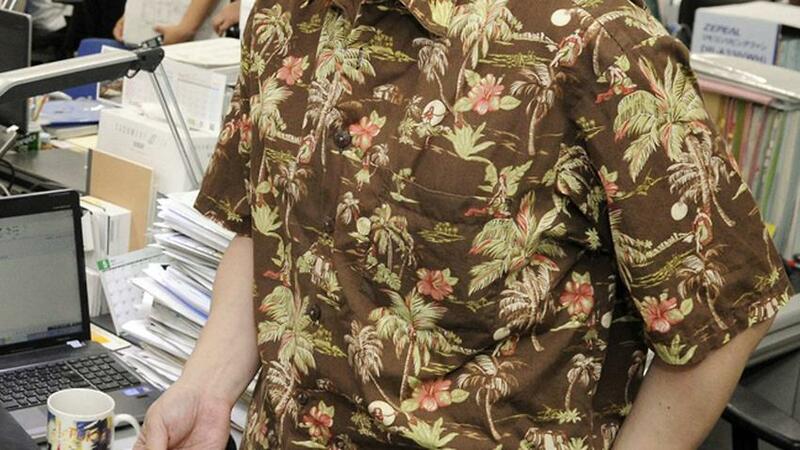 In Tokyo last year, the Environment Ministry asked people to show up for work wearing what they called "super cool biz" clothing – please, no suits and ties for men, but Hawaiian shirts instead. There was actually a serious reason to this. The Japanese want to spend much less energy on air-conditioning, in fact they need to reduce use by 15% during the summer months to avoid electricity shortages. Armed with an argument like that, maybe the boss would even buy it if we showed up at the office wearing Hawaiian shirts.